* (1948)- Born & Raised Germany 12 yrs. Joseph Lawski, better known as Joseph the Magician has performed magical illusions on Hilton Head Island and the surrounding area since 1990. He has worked at many of the local restaurants showing guest a variety of "MIRACLES" that astonish and entertain Kids as well as Adults. 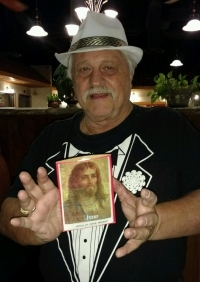 After 20+ years performing on Hilton Head, an accident caused a broken shoulder which hindered Joseph's ability to perform his larger act, He prayed for guidance, and he received inspiration for "Jesus in your Pocket". Using his knowledge of illusion; he created a Magical way to introduce the BIBLE that leads to significant opportunities . 1) Ministers / Counselors "LEARN" how to perform "Jesus in your pocket"
3) Students "LEARN" to perform the Trick and then "SHARES" it with their FAMILY and FRIENDS..
Help me fund this worthwhile cause...Click below to order! To VIEW your Instructional Video a Secret Code is required. The Code is inside your (Jesus in your Pocket) Packet.. PLEASE CALL For DATES & TIMES...Thank you..
Why Hire Joseph to your next Party ? ?